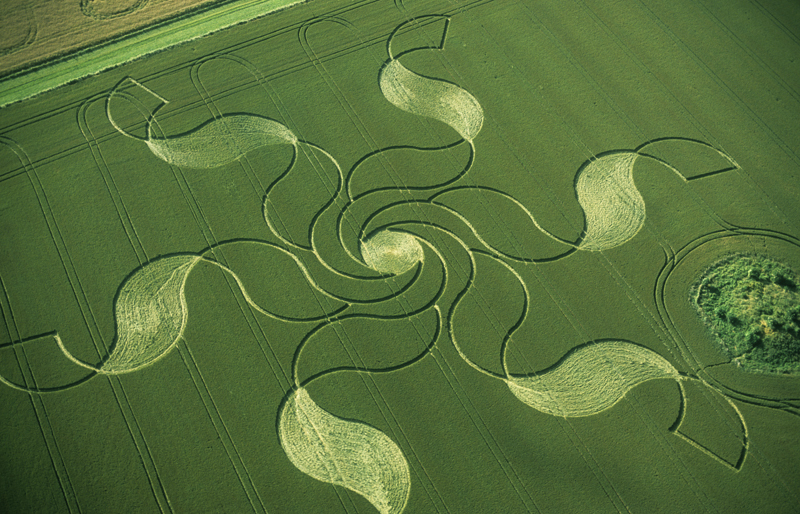 2002 was a year of real beauty in the fields. 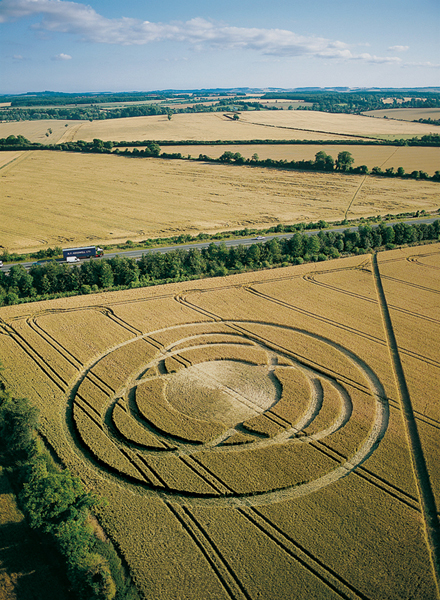 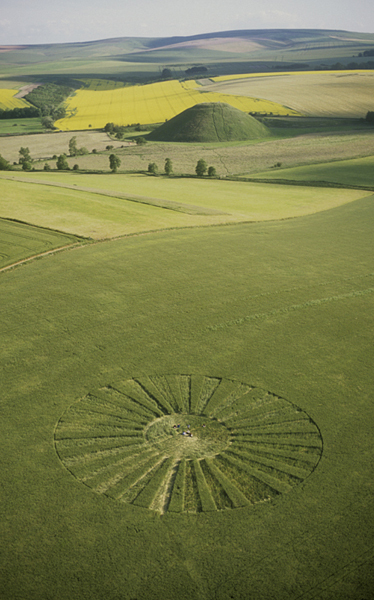 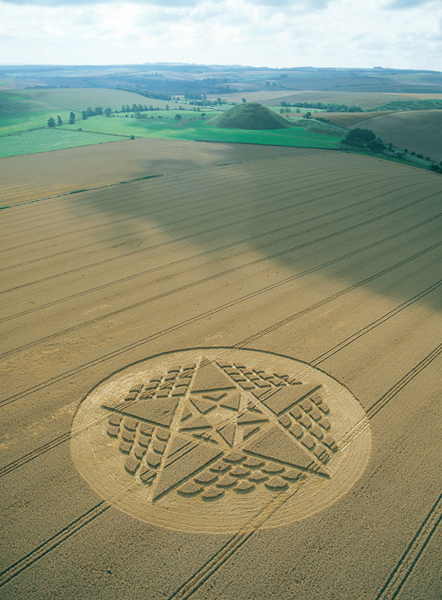 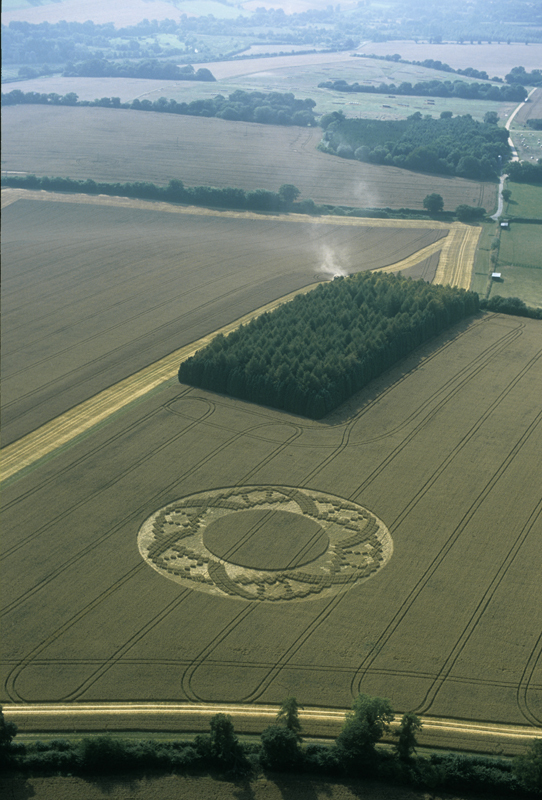 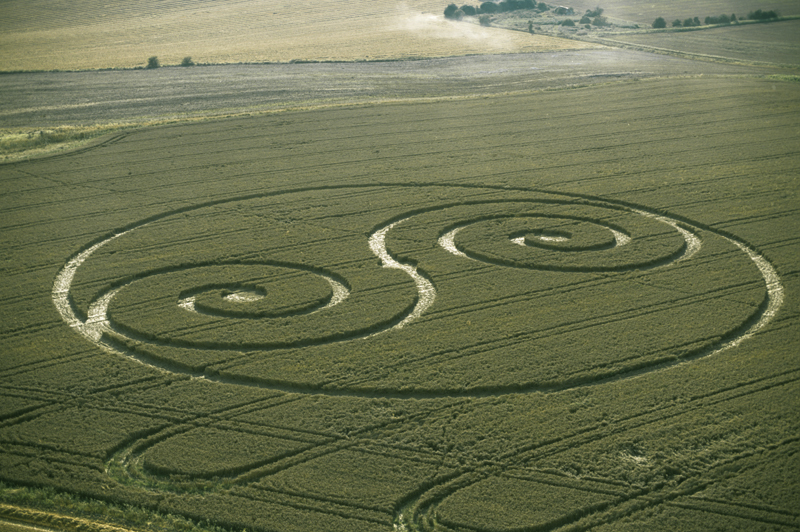 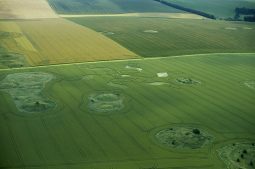 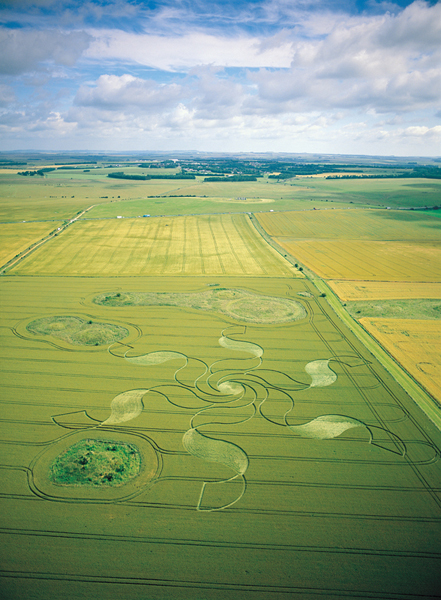 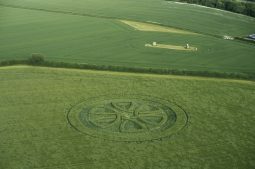 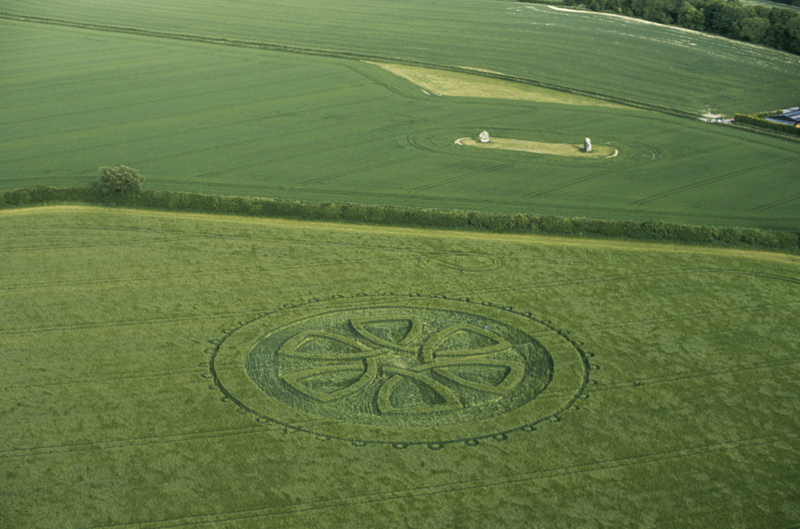 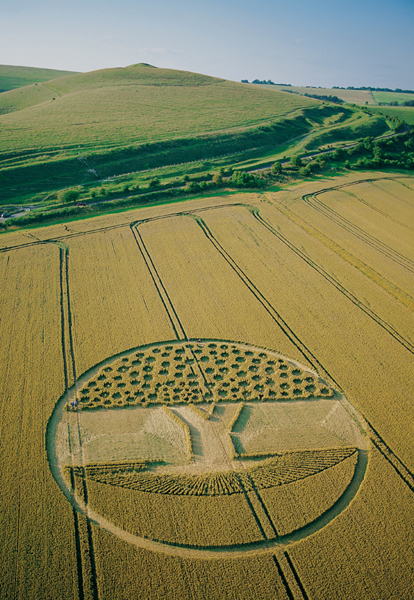 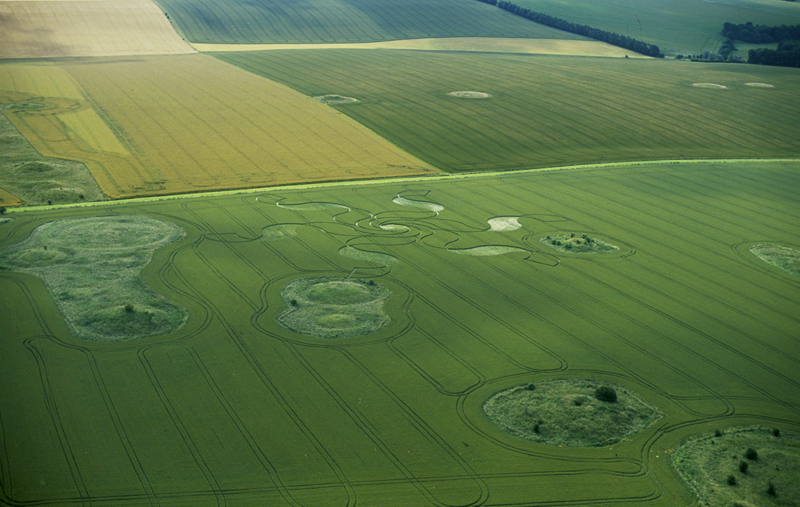 Once again two formations dominated the season, the first was the stunning and unsurpassed Crooked Soley ‘DNA’ circle, the second was the incredible Sparsholt ‘Alien Face and Disc’. 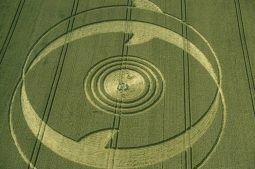 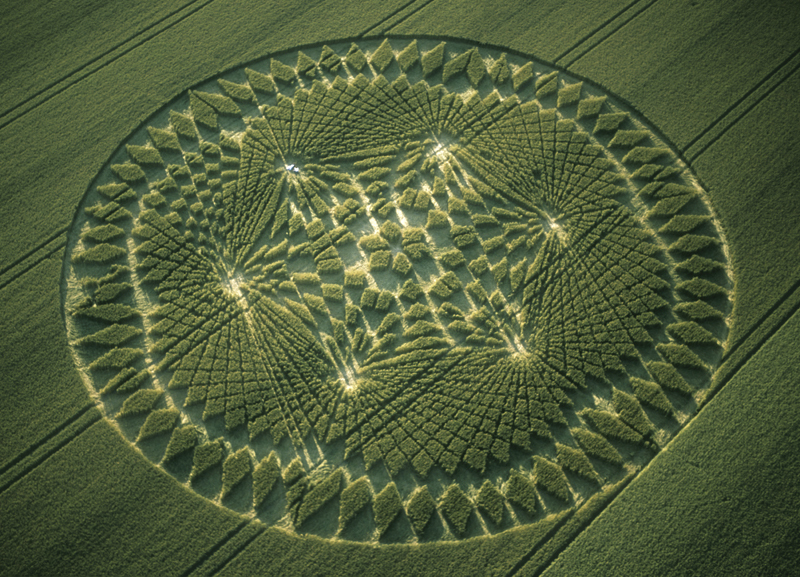 The circle at Crooked Soley showed a DNA helix in a ring around a central standing circle, and was filled with fabulous magical and sacred numbers. 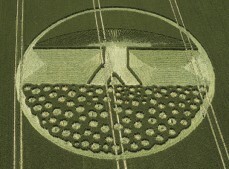 The Alien Face and disc contained this enigmatic message: “Beware the bearers of false gifts and their broken promises. 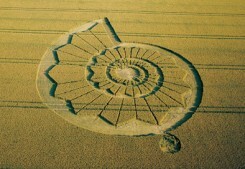 Much pain, but still time. 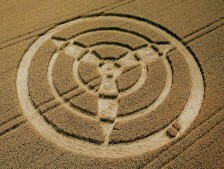 Believe. 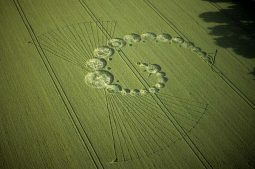 There is still good out there. 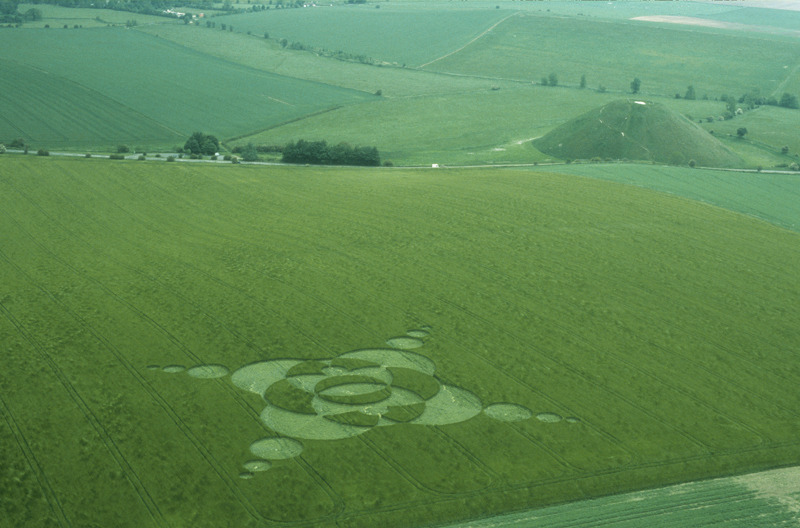 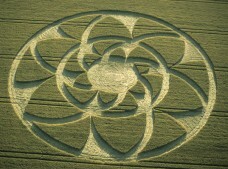 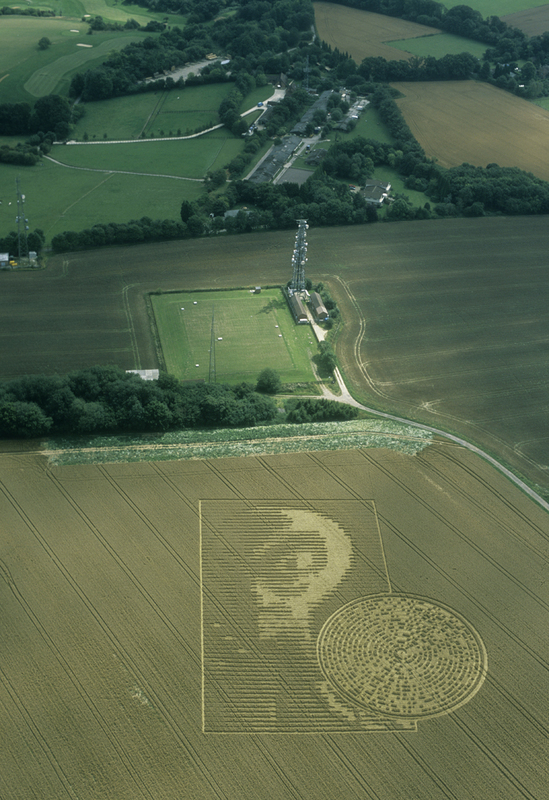 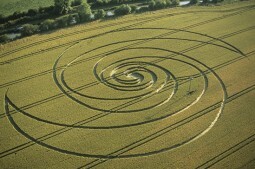 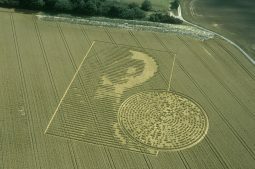 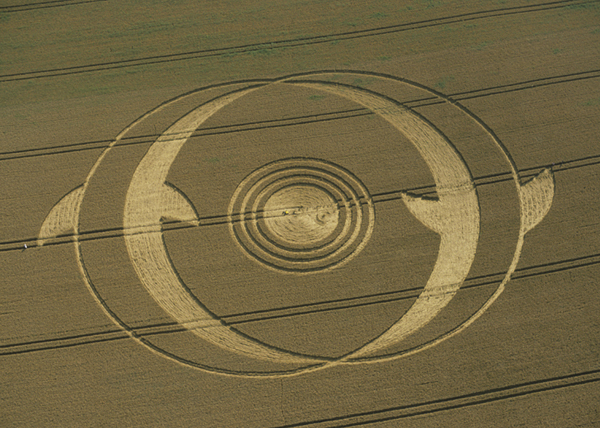 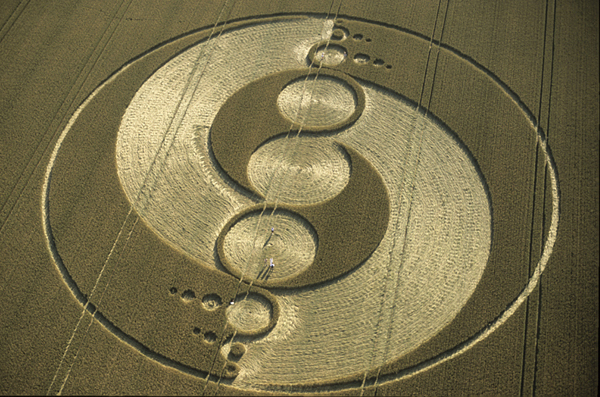 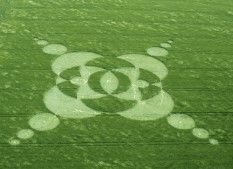 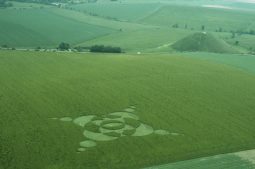 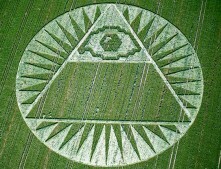 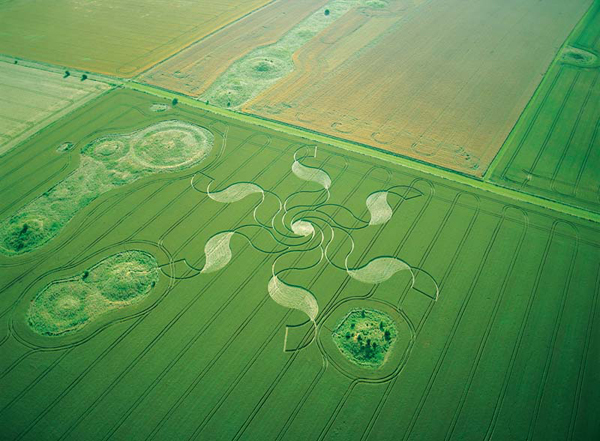 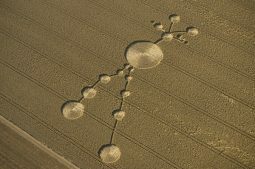 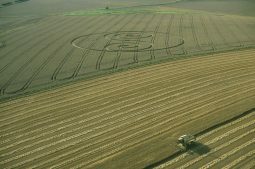 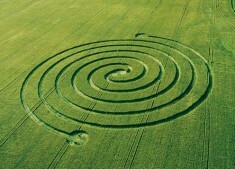 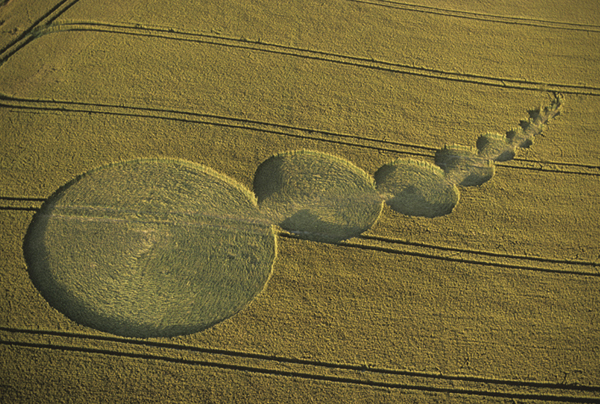 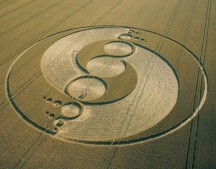 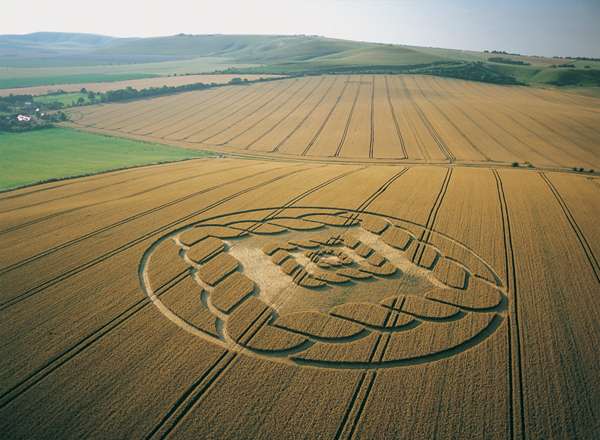 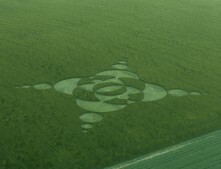 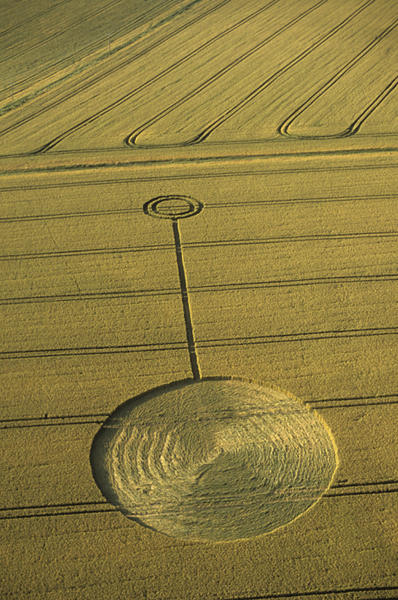 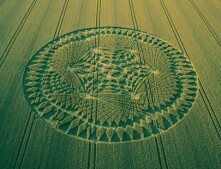 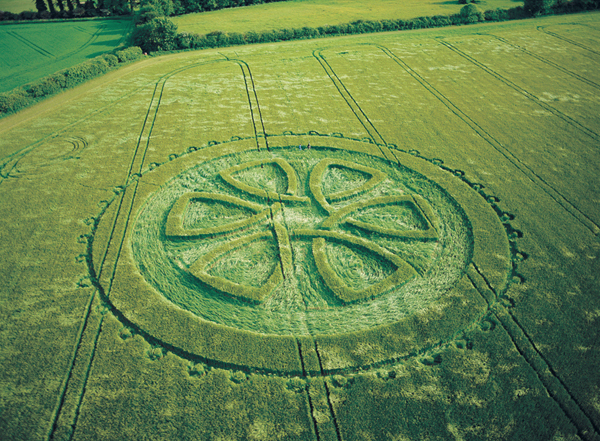 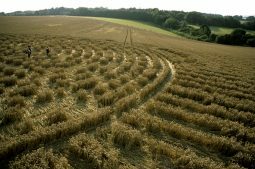 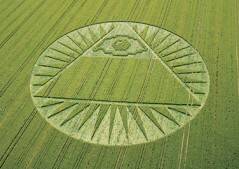 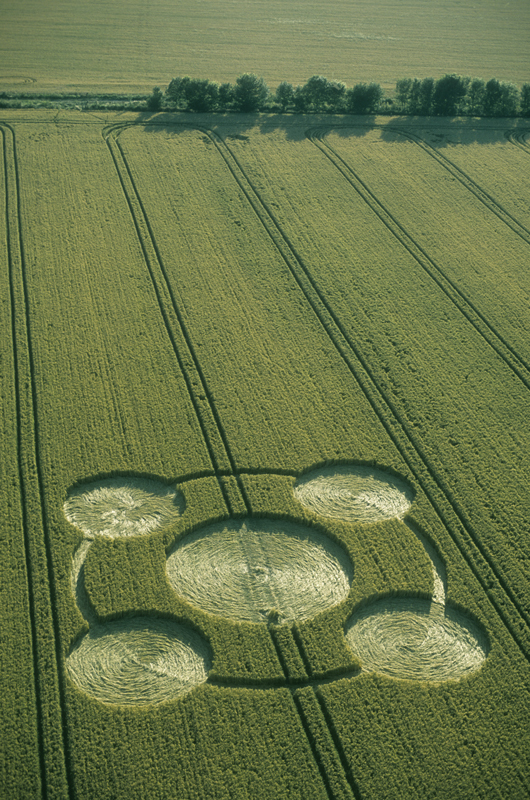 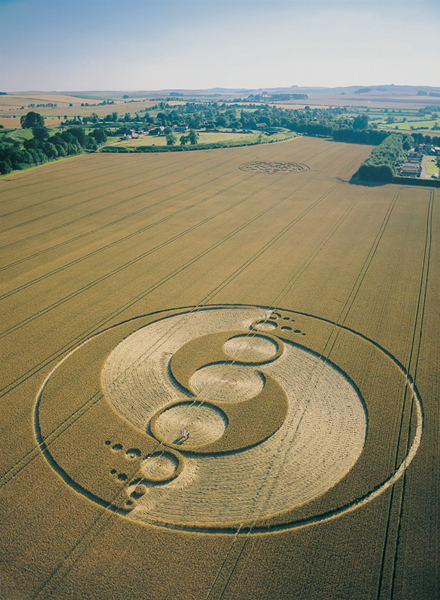 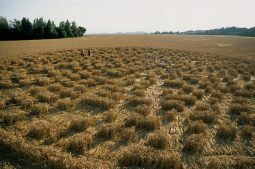 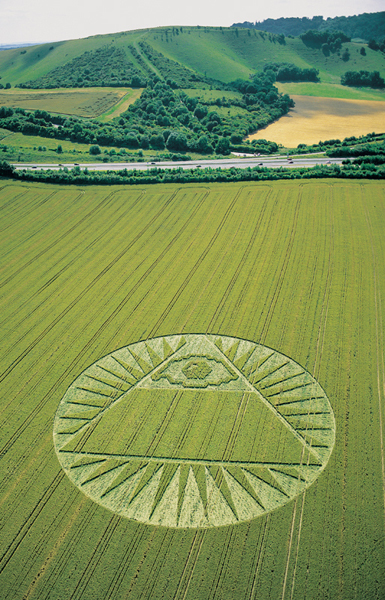 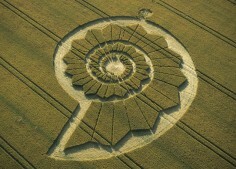 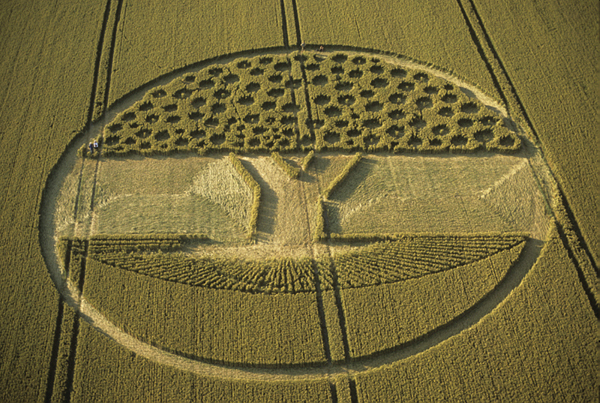 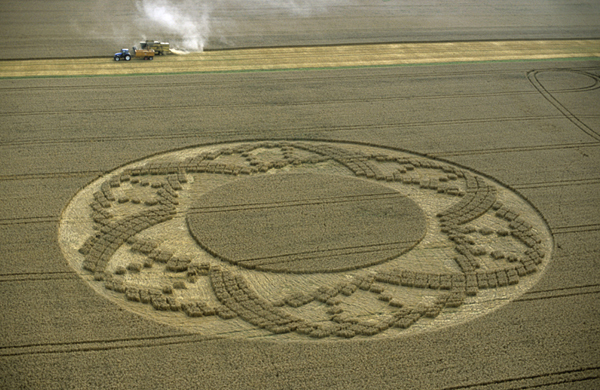 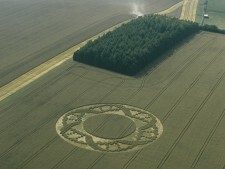 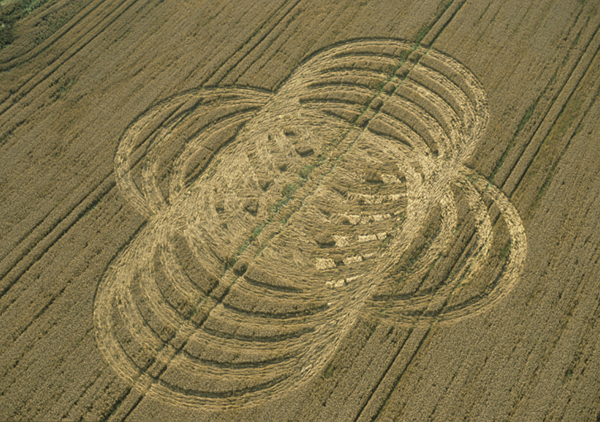 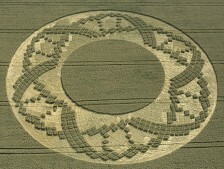 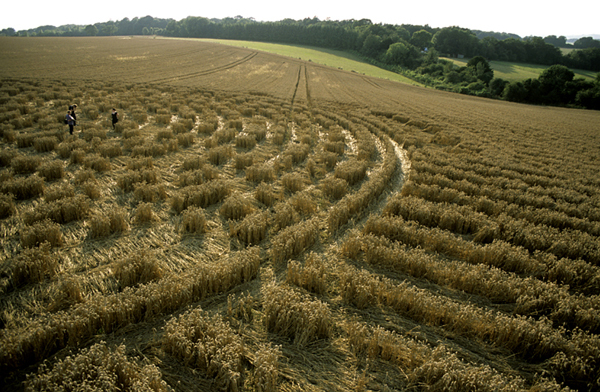 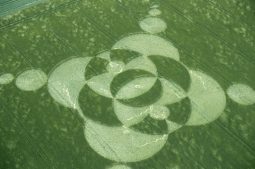 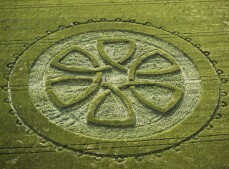 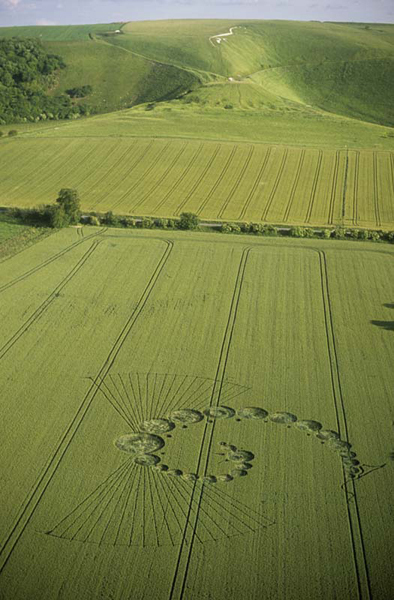 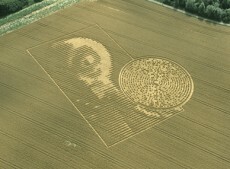 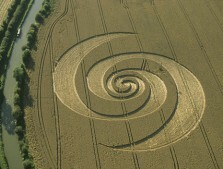 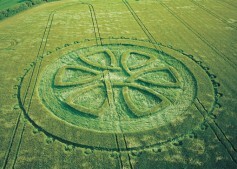 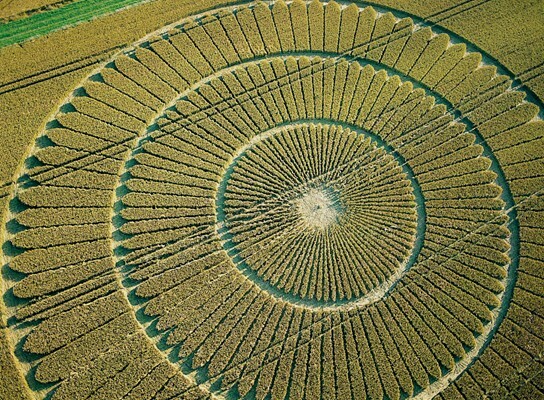 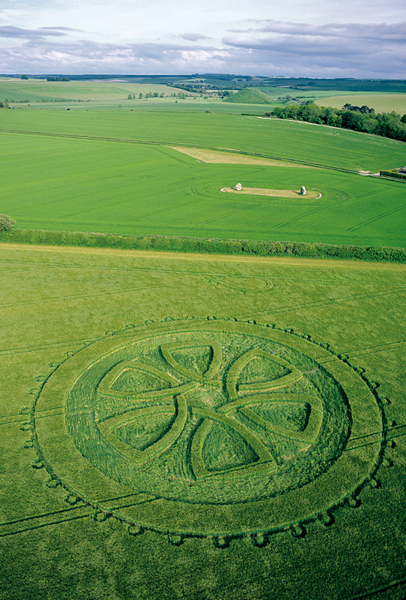 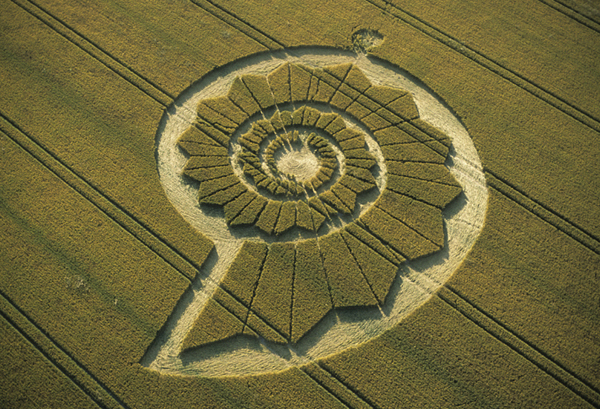 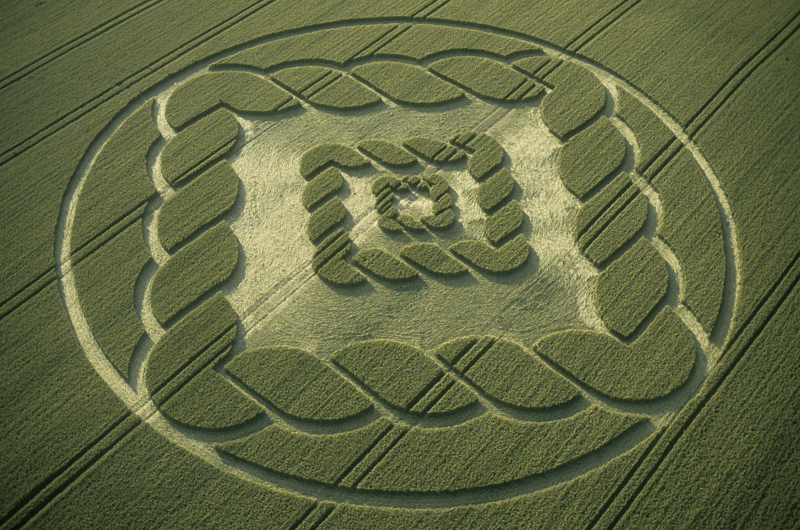 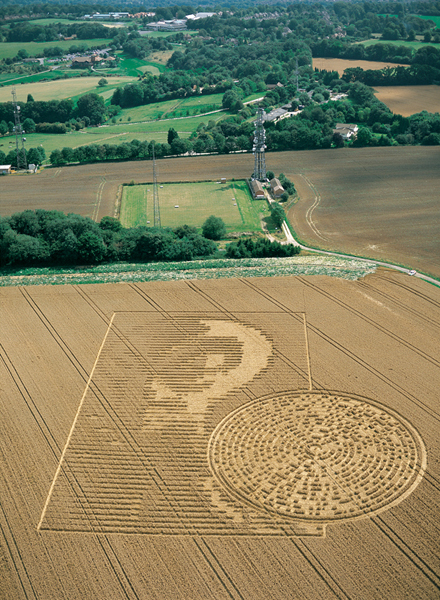 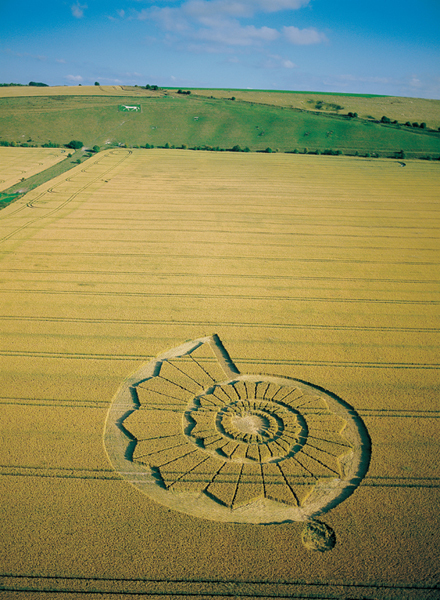 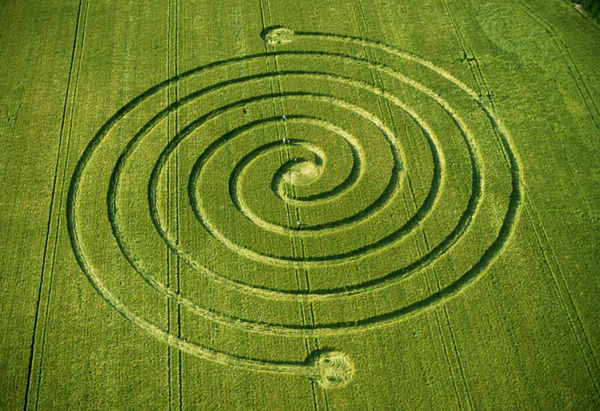 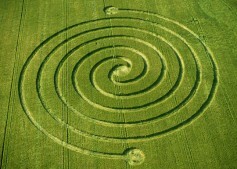 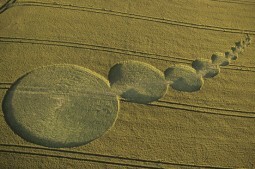 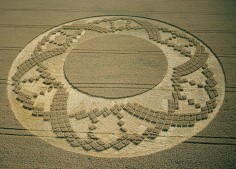 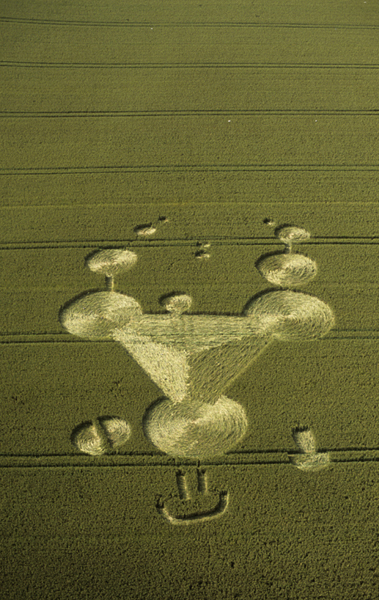 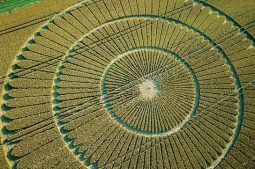 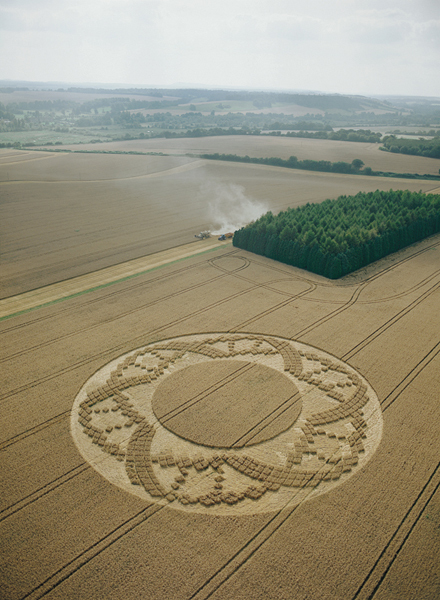 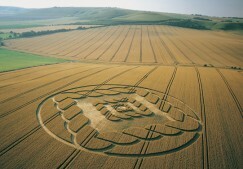 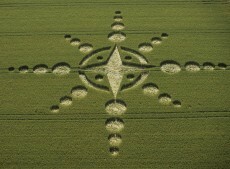 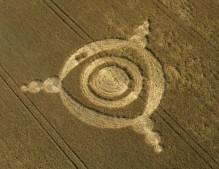 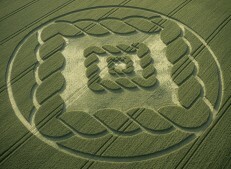 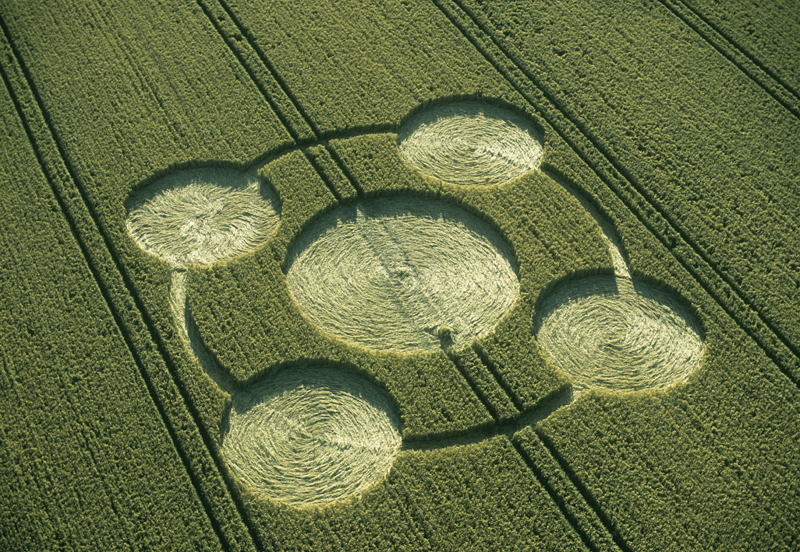 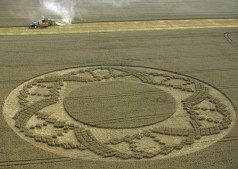 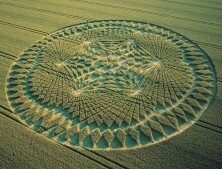 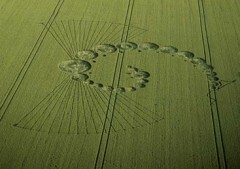 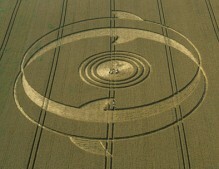 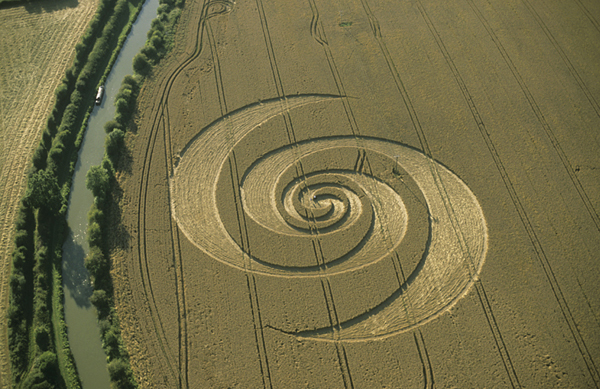 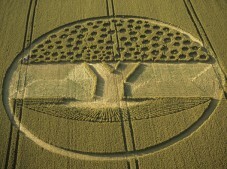 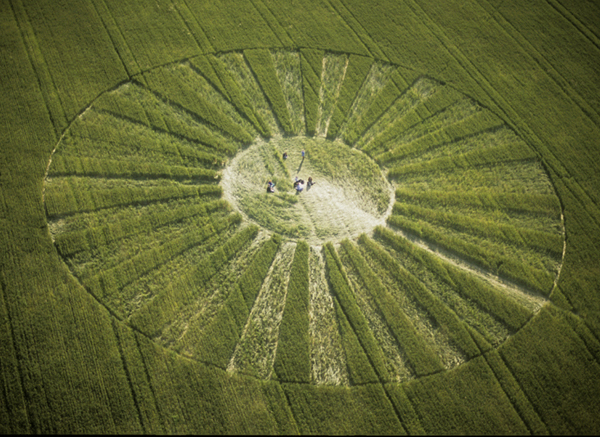 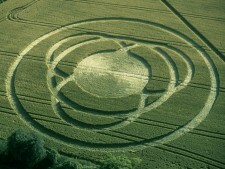 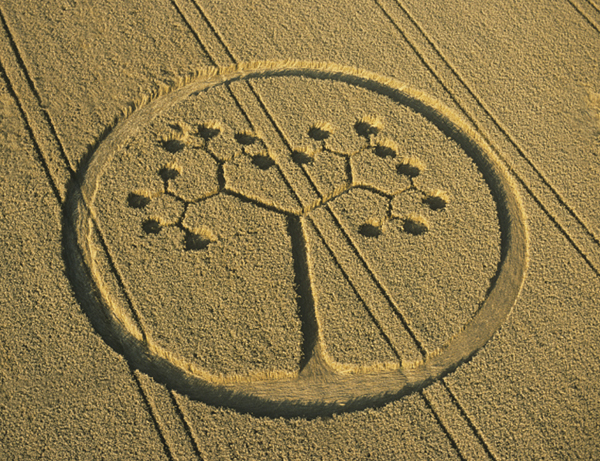 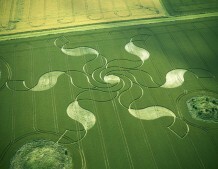 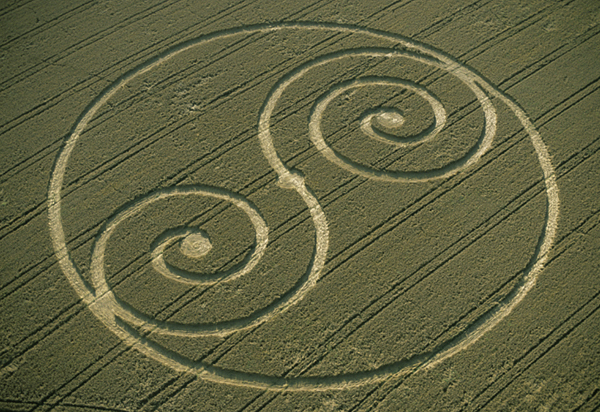 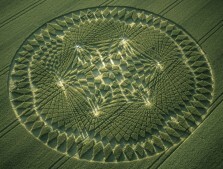 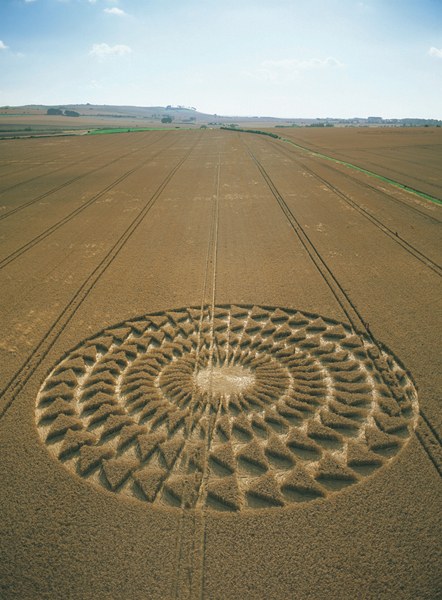 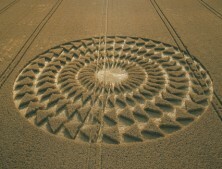 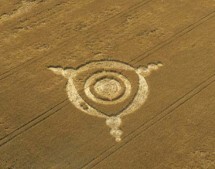 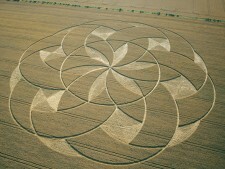 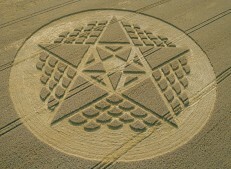 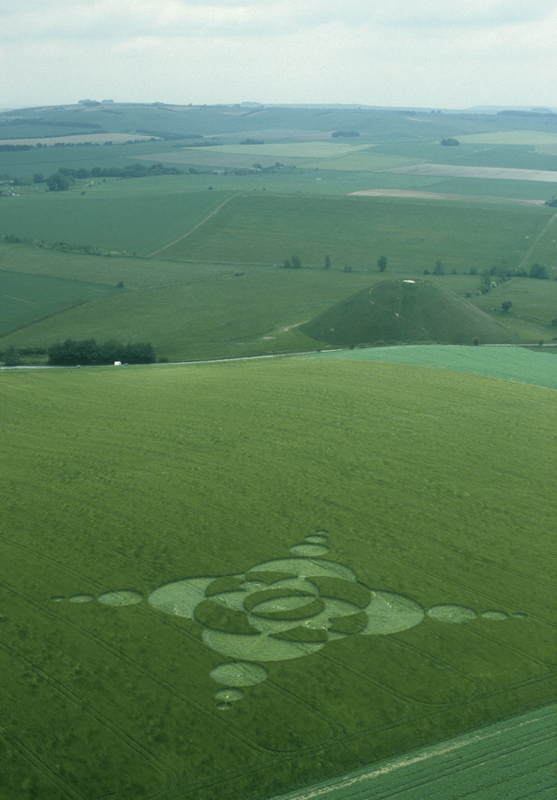 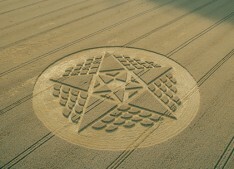 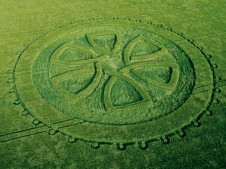 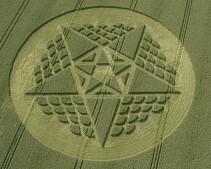 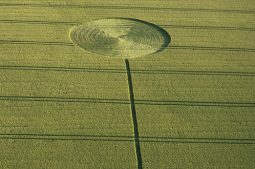 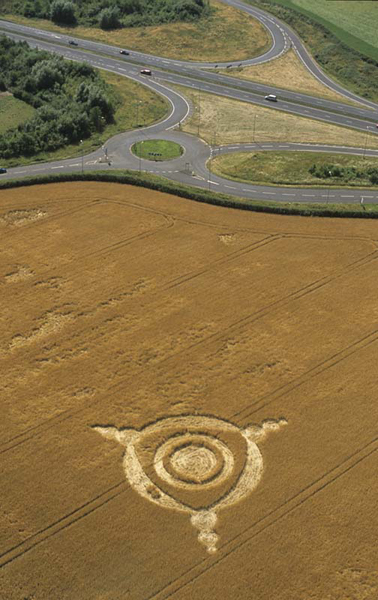 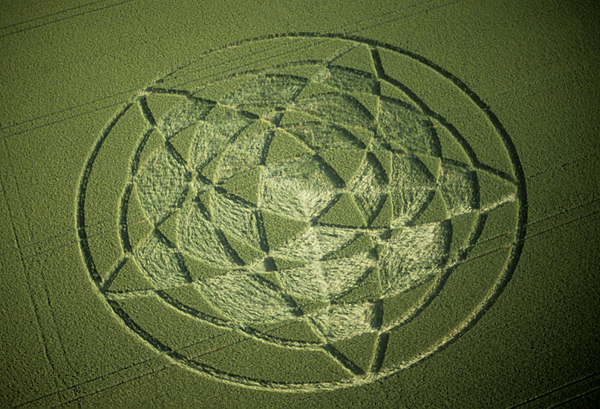 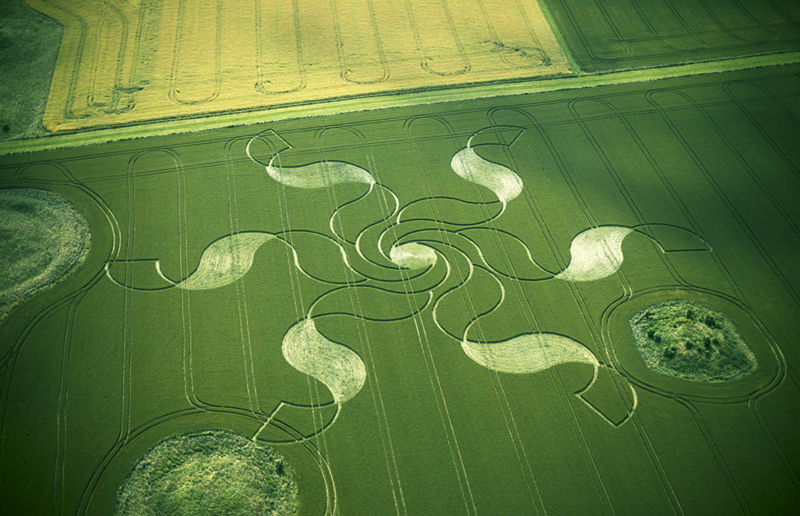 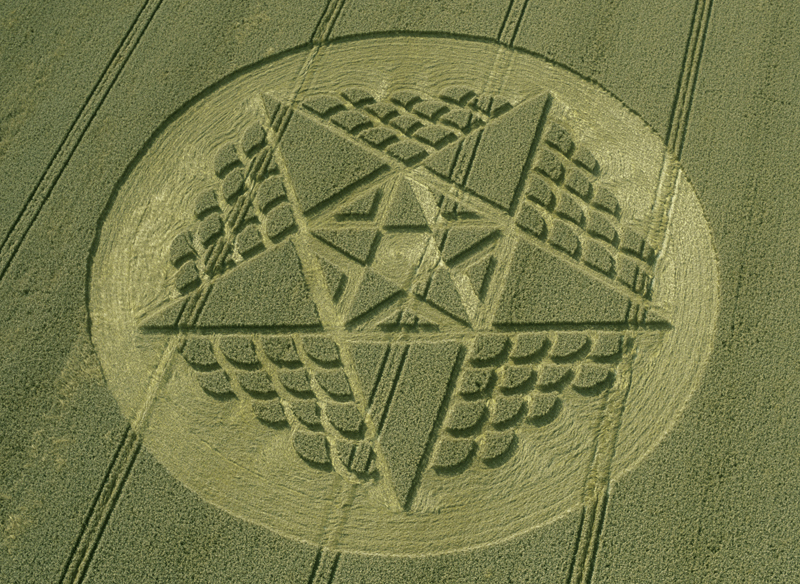 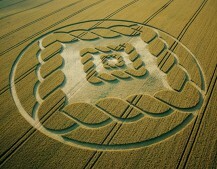 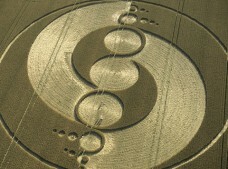 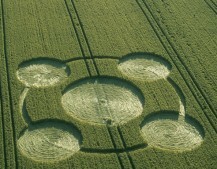 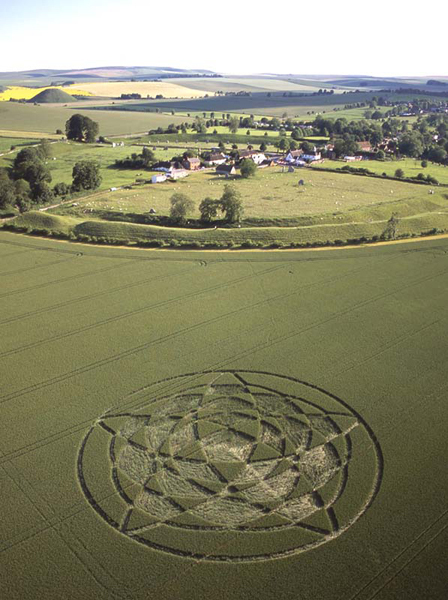 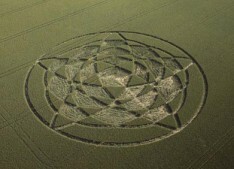 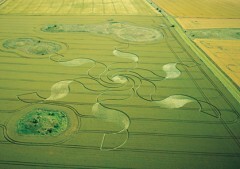 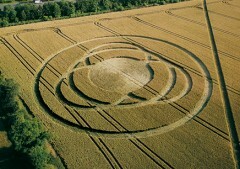 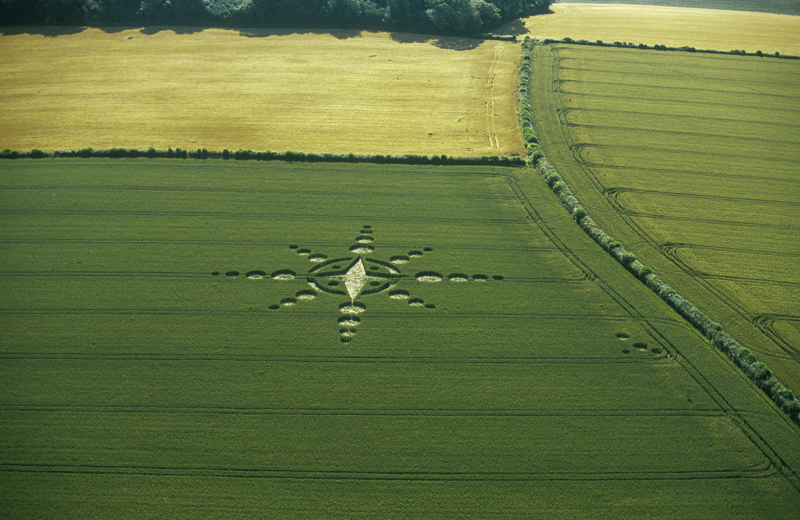 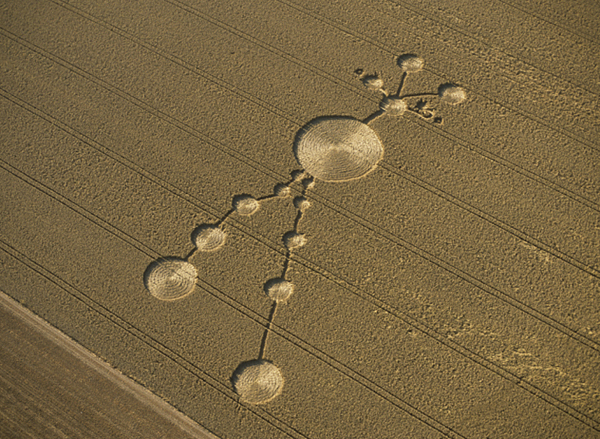 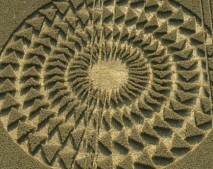 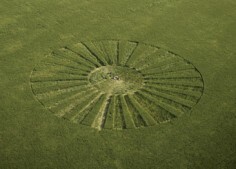 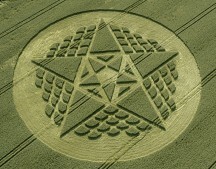 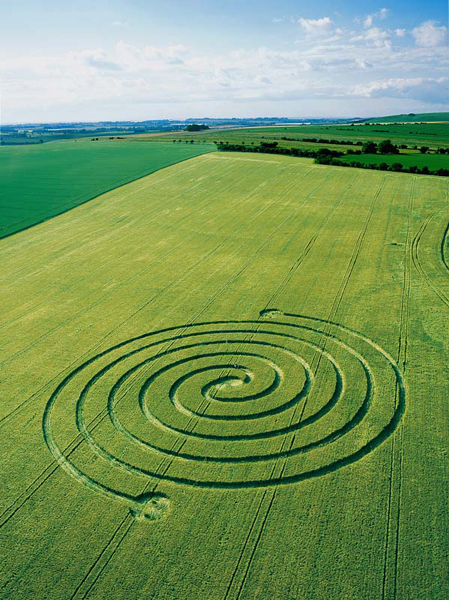 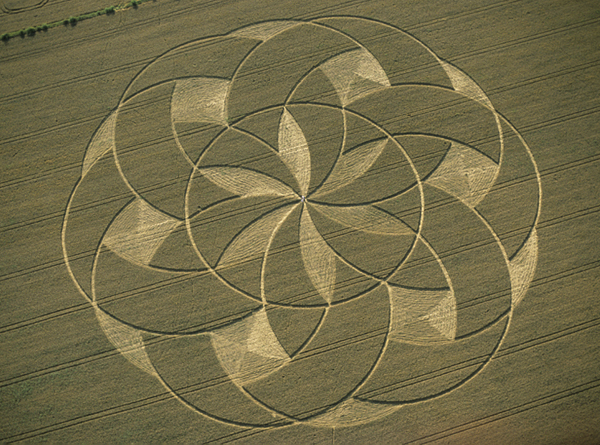 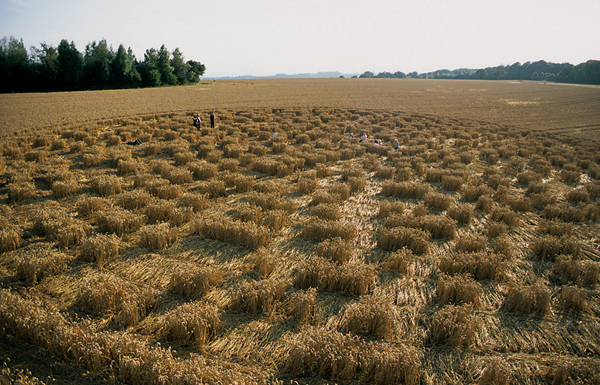 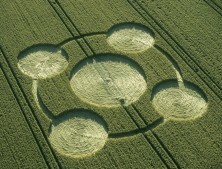 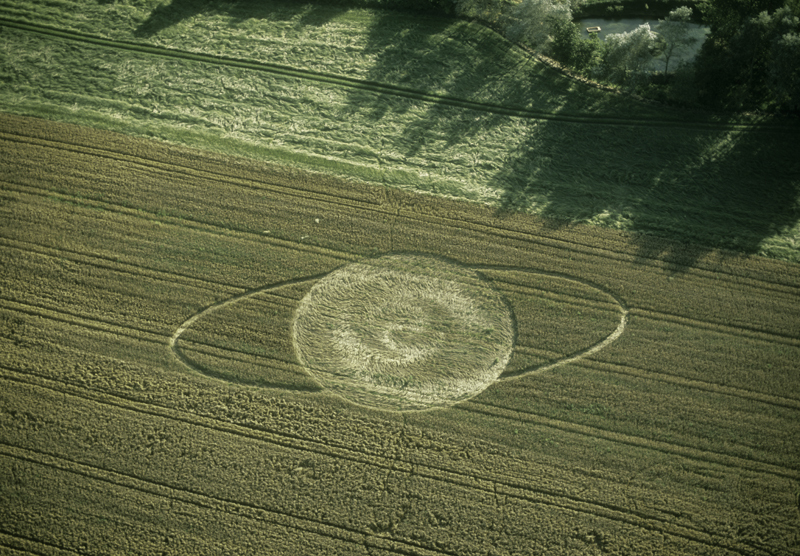 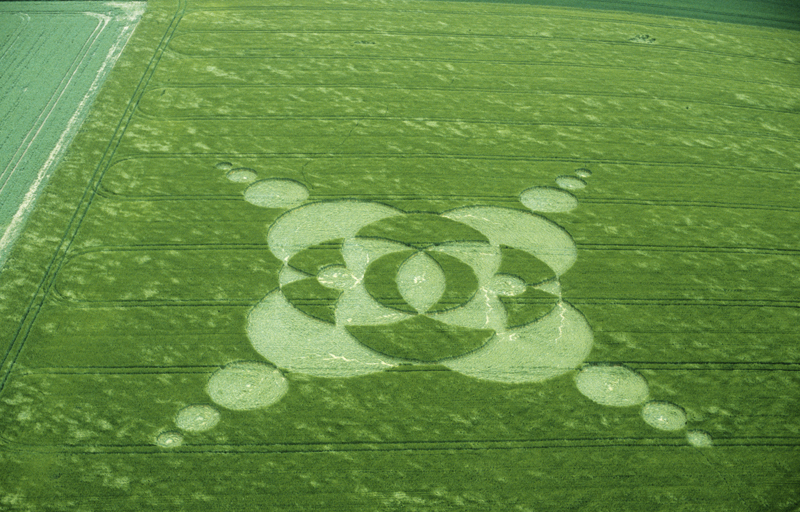 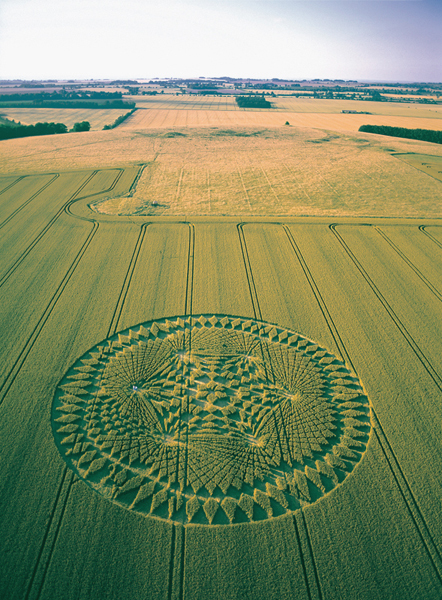 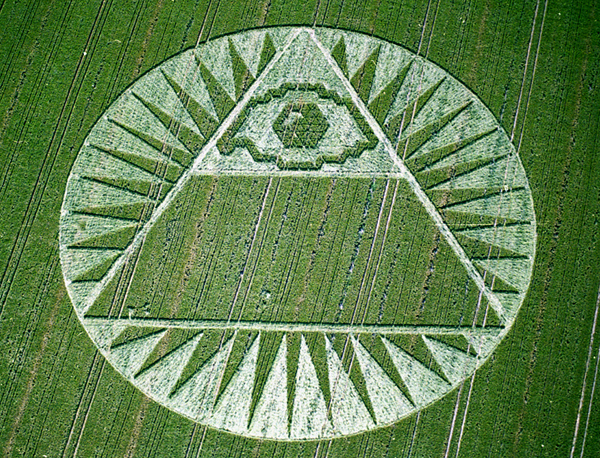 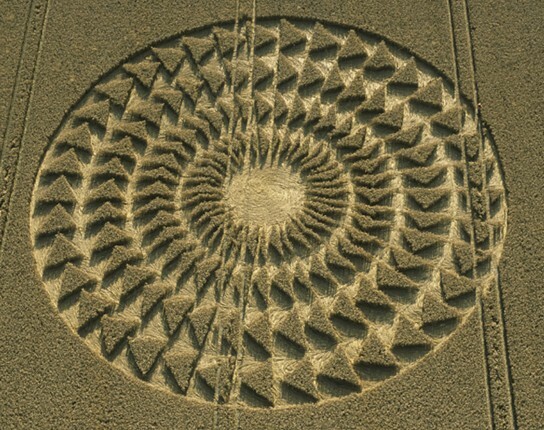 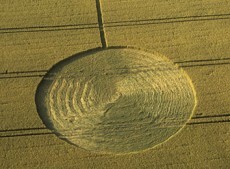 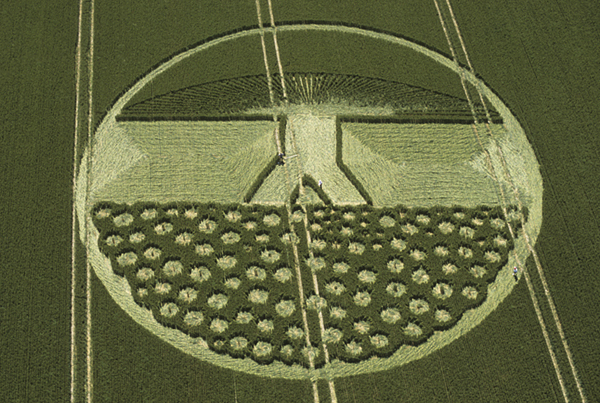 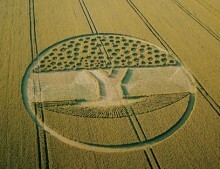 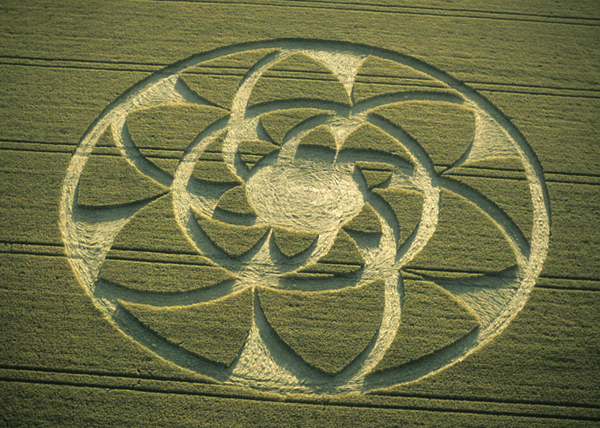 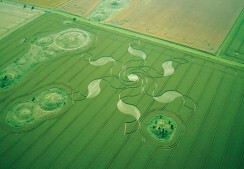 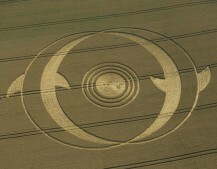 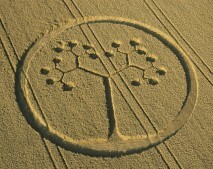 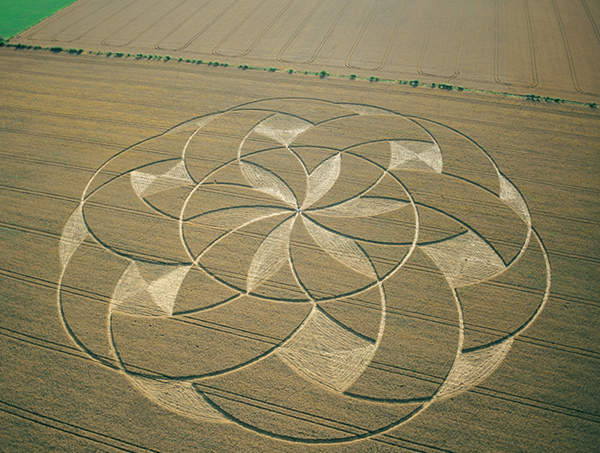 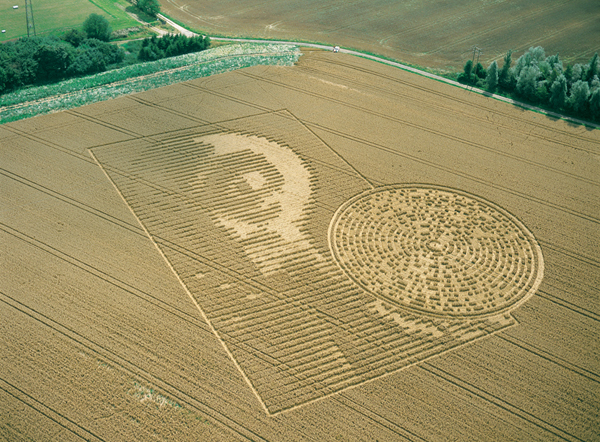 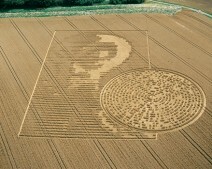 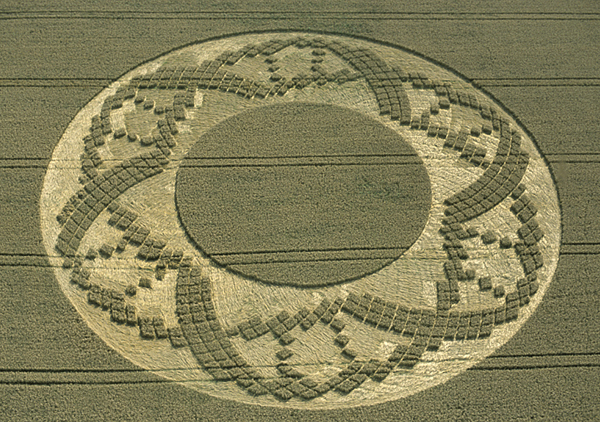 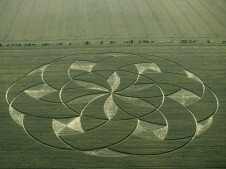 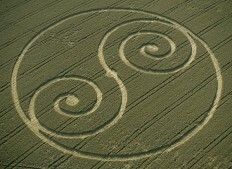 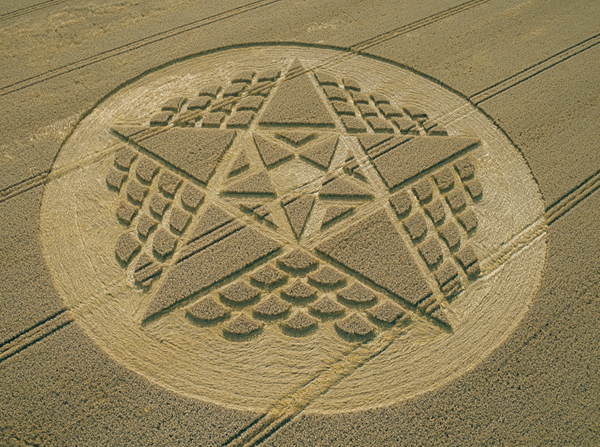 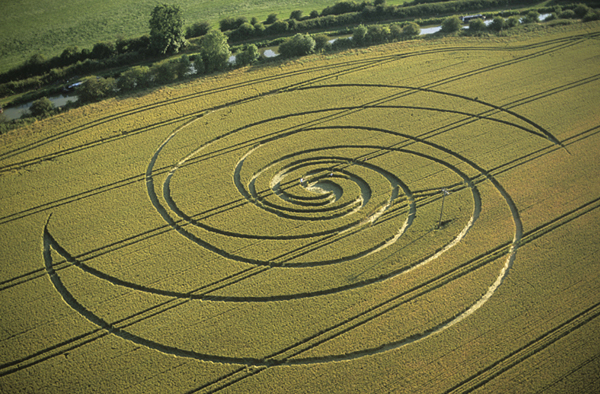 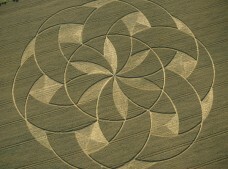 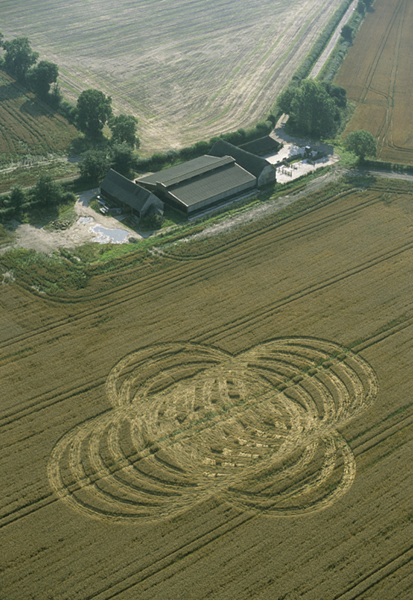 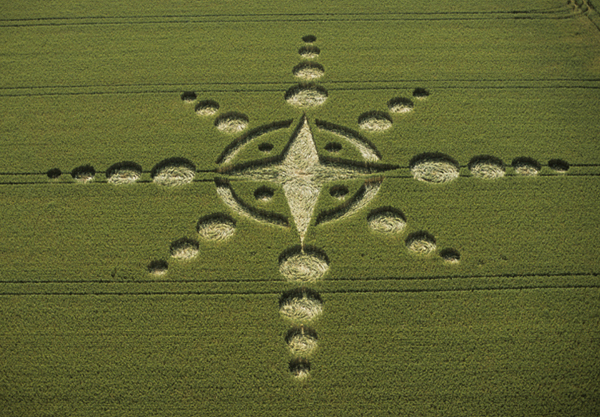 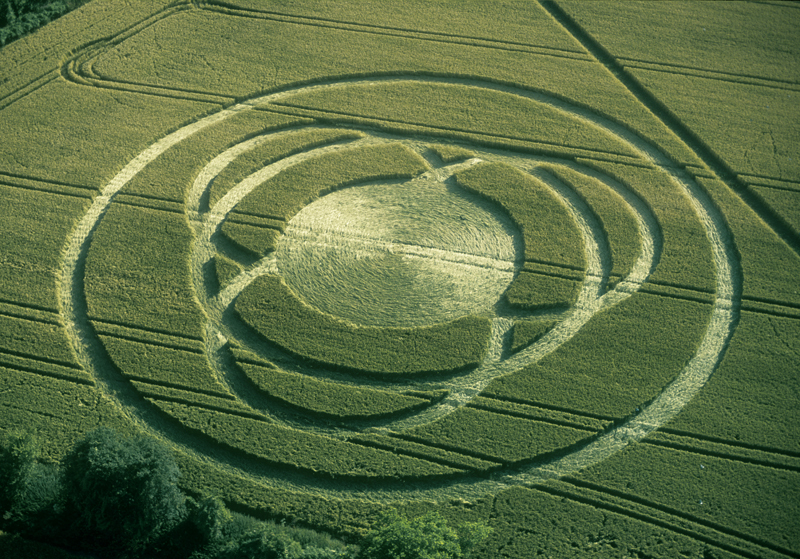 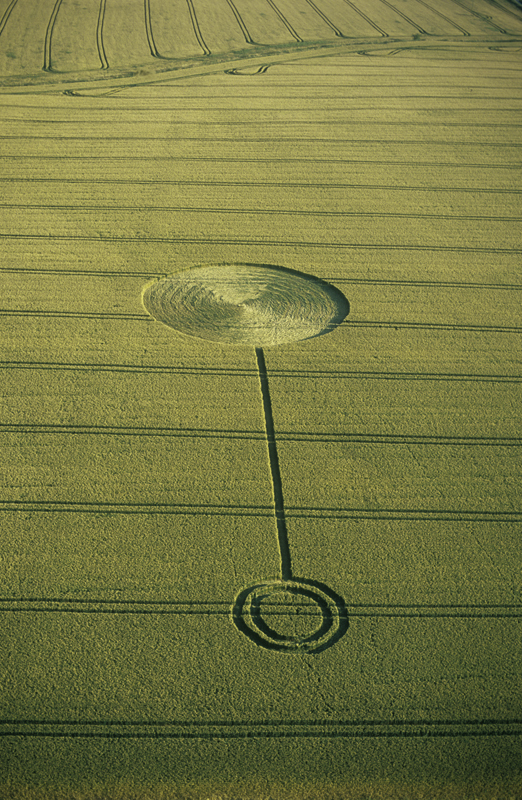 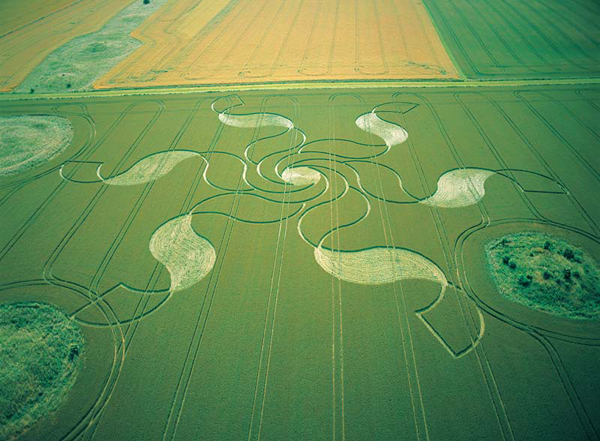 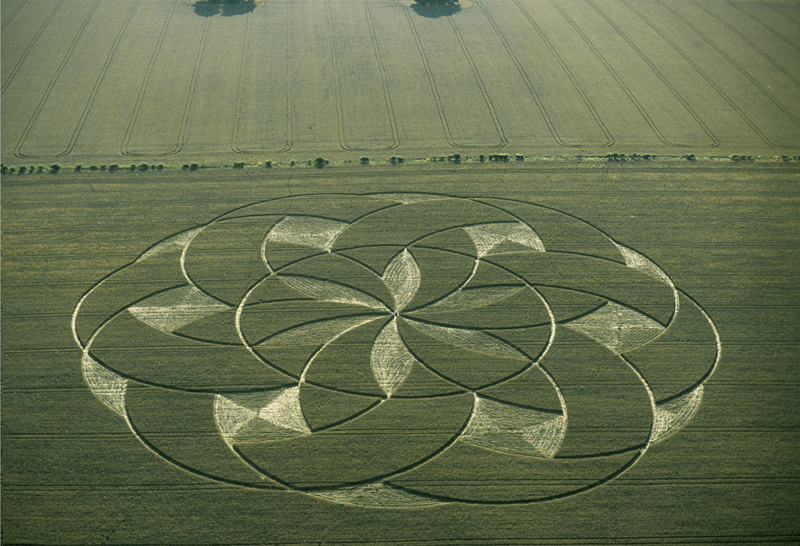 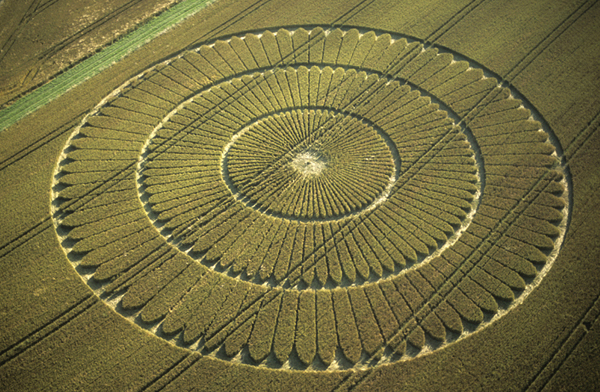 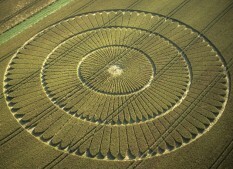 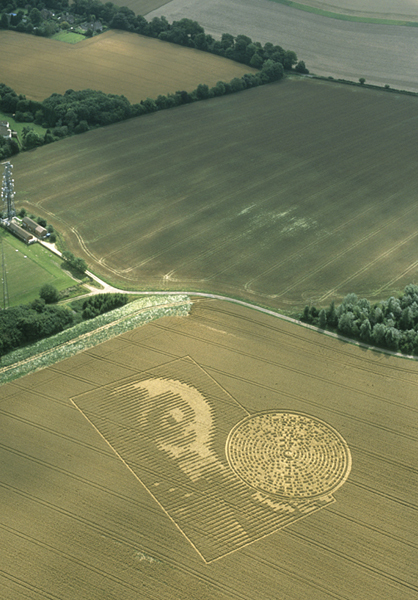 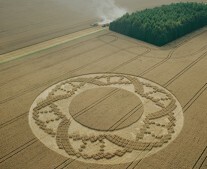 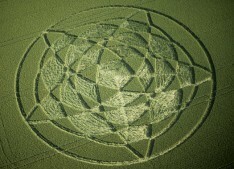 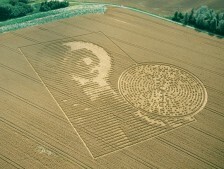 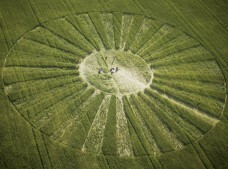 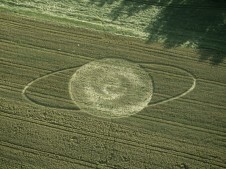 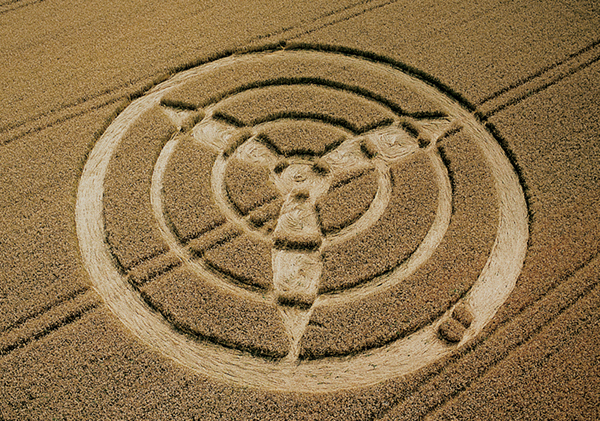 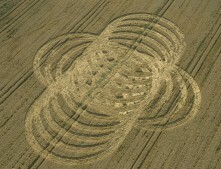 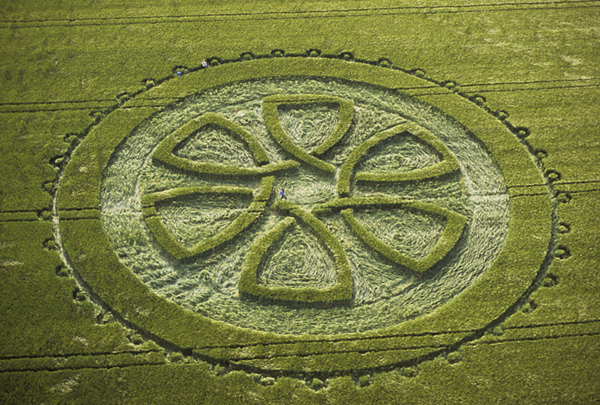 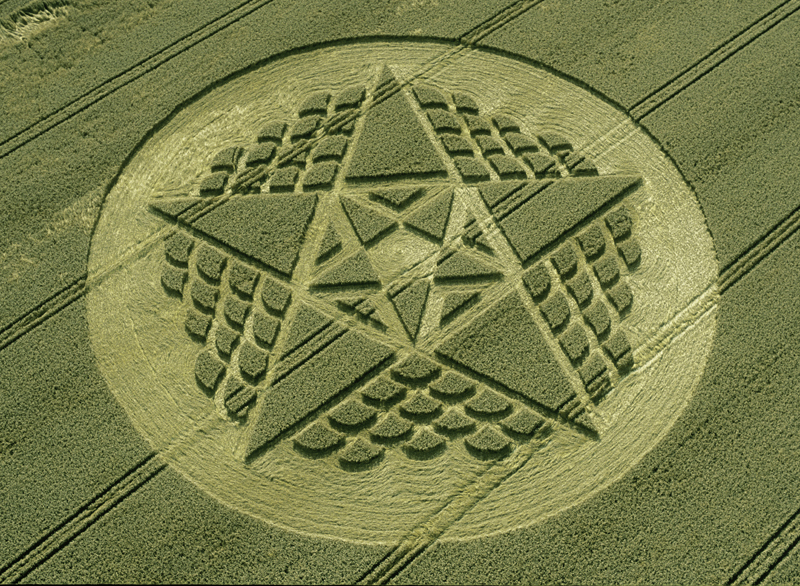 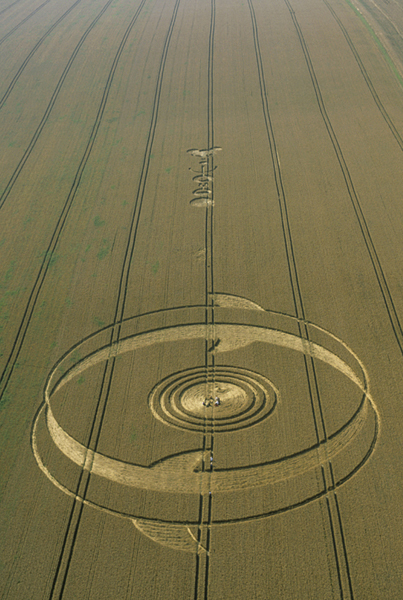 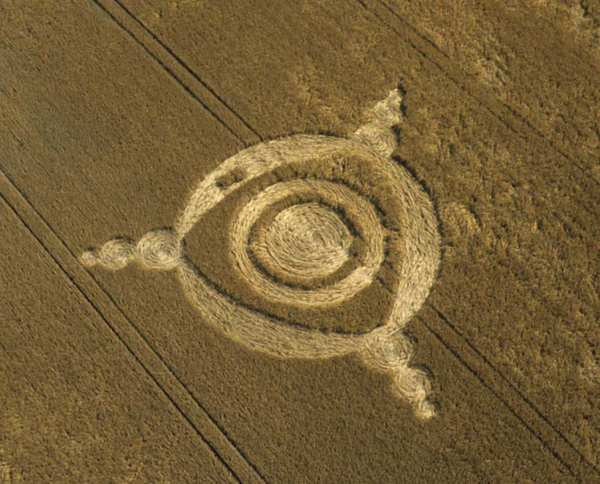 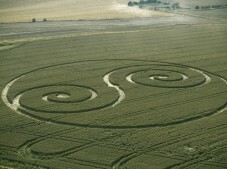 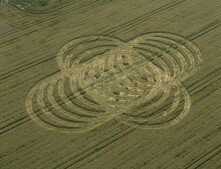 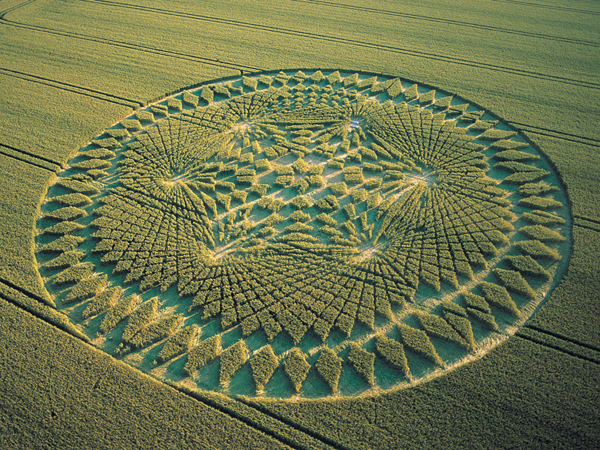 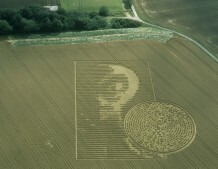 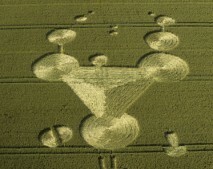 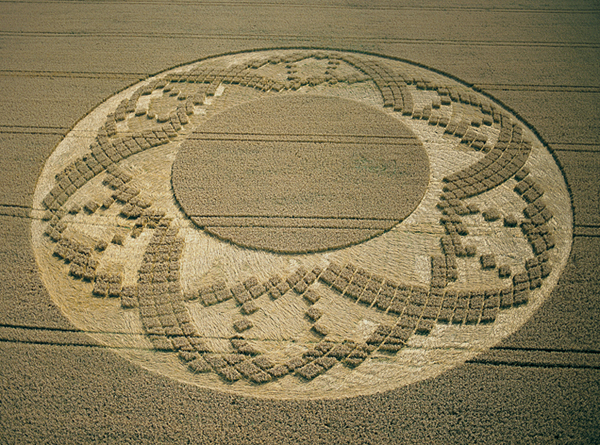 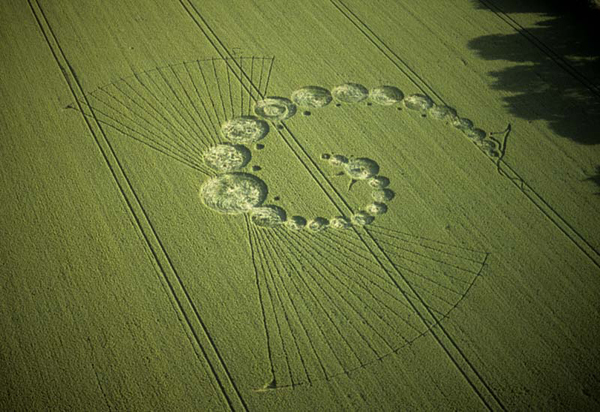 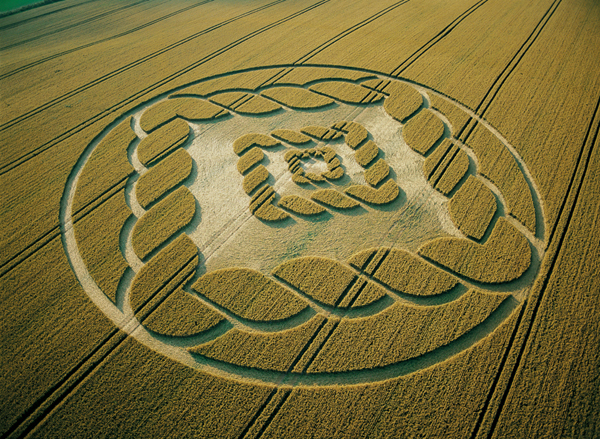 We oppose deception.” It remains one of the best know crop circles of all time. 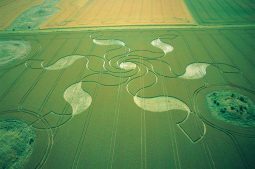 Many of the formations of 2002 seemed to have particular elegance, the Ribbons at Stonehenge; a six-fold arrangement of ‘floating’ ribbons was placed precisely in a field of round barrows with the ribbon tips brushing field boundaries and barrows – it was perfectly placed. 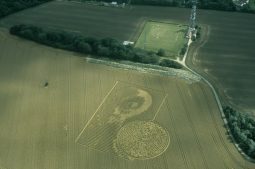 Other highlights included the Tree/Mushoom in East Field, Alton Barnes, the squared ropes in South Field and the Pyramid with Eye at Highclere. For this new website we have gone back through our archive, and painstakingly scanned and cleaned up many of our images to share with you for the first time – we hope you enjoy them!